With the amount of hours that people spend on computers these days, now's the time for some sharp educational business to offer schooling lessons via the internet. They're already doing this in college, why not for the little ones? All I know is that parents shouldn't waste any time wondering what to do. Rowena- people have even named their cats and dogs after their teachers. The situation does not bode well for people pursuing a teaching profession in the public school sector. Online education and instruction might be an option. I agree. Same as how online shopping has replaced brick and motar shopping with better results from reputable retailers. I had at one time considered teaching. I have an interest in history, literature and the social sciences. I don't know if it's worth it anymore, unless you're working for a private school or teaching college. It's rather disgusting how many days of school the kids are missing. At the rate they're going, you might be better off home schooling. At least then you know your kid will be getting an education worth having. 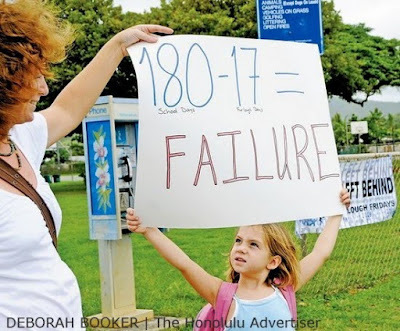 Brad- I would have reservations about teaching public school, at least, in Hawaii after the furlough debacle. Up to relatively recently, the State was recruiting teachers from the mainland to fill all the vacancies, and this situation is definitely not gonna make it more attractive to teach in Hawaii with our status of having the highest rent in the nation. On top of it all, the custodians and the grounds crews are still working at the empty schools on furlough fridays because they belong to different unions, if that makes any dollars and sense. These workers get paid for a full 12-months of the year, while teacher's only 9-months....12 montly paychecks, but proportioned on the 9-months dollar amount. My cousin and his wife are teachers in Georgia and they get paid 12 months, but it's the 9 months pay stretched out to cover the other 3 months. As for the janitors, I think it's kinda ridiculous that they should get paid for time when the school is closed. Brad- the custodians were on last night's local news explaining that they'll get to do heavy duty cleanup since the campus is empty. Heck, what'll they do during summer break and school vacations. Shouldn't janitorial duties be done at night, after the school is closed? Isn't it empty then anyway? Sounds lame to me. Brad- the insult is that the custodians are still getting their paychecks on furlough fridays while the teachers aren't. Under that logic, they should leave the lights on in the empty classrooms so the electric company doesn't lose money.